IMEX Frankfurt is fast approaching and so our agendas are getting filled with business appointments and social events. You might want to impress your client, or just catch up with a business partner or a friend after the long day and you look for a nice restaurant in Frankfurt. Or maybe you want to stay few days longer for bleisure and are looking for trendy places to wine in dine in the city? We, event professionals, are pros searching for the best restaurants, but we also love a good recommendation from a fellow planner, aren’t we? To make your life easier, and I know how busy you are, I put together a list or some of my favourite places and also asked my colleagues for their top tips which I share with you here below. If you are a fan of German cuisine then I can highly recommend you the Druckwasserwerk. I visited few summers ago, not during IMEX through, so we were able to sit outside on the terrace and that was very pleasant. But they also have a beautiful space inside, perfect for large and small groups. They have 180 seats in the restaurant, 50 on the gallery and 300 outdoor. I know from talking to colleagues that this is a popular place for IMEX attendees so can advise you check for availability before going there. I took the Wiener Schnitzel and it was one of the best ones I’ve ever had (The second best was in Munich in Andechser am Dom). For Asian cuisine, and specifically Vietnamese in this case, I can recommend you the Ong Tao. This restaurant is a walking distance from the Messe and it tucked in a residential area, so the clientele seems to be a mix of business and locals. The food was very delicious with very good options also for vegetarians. The inside area has capacity for 40 people and outside for 70 people. The non-alcoholic smoothies and cocktails are an absolute highlight! If you want to go for Italian cusine, then you should definitely visit the Trattoria i Siciliani, that is praised for serving homemade Sicilian recipes according to old traditions. The moment you enter there you feel as stepping into Italy. The décor is very impressing and very cosy and family like. The restaurant is rather small, so small meetings will be ideal. When I was there one weekend it seemed that the place was visited by regular guests and locals. Last but not least from me is a breakfast place called Ginkgo. They serve food all day but mostly famous for their breakfast. They have also options for vegan and vegetarians, and the vegan pancake is a must. Another favourite is the crunchy homemade granola. The place is located in a residential area, so away from the touristic places and also frequented by mainly locals. 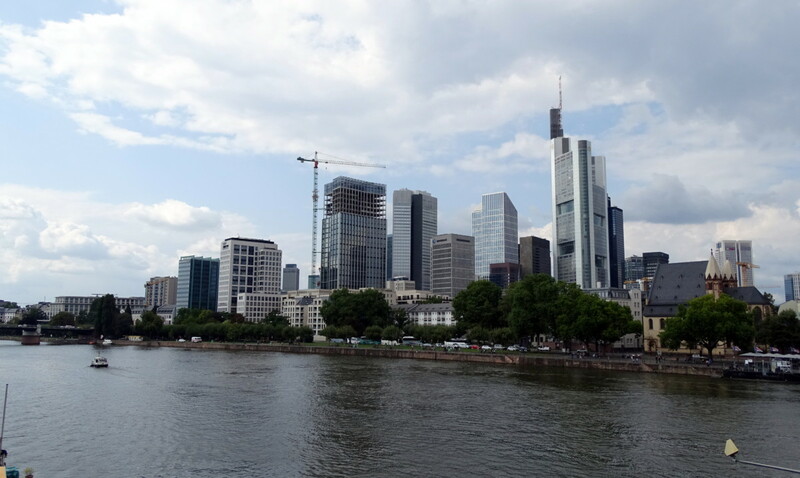 That would be the perfect choice for you if you stay an extra day and want to experience Frankfurt as a local. Milda Salciute, CMP – Knowledge & Events Executive at IMEX Group, shared that her favourite restaurant is Laube Liebe Hoffnung. It’s right around the corner from the Messe, innovative and sustainable with a beautiful terrace and great vegetarian options! Roger Lehner, Organising Executive at IMEX Group shared that his “favourite place is, of course, a cafe – Wacker’s but if I had to choose my favourite restaurant it would be Salzkammer“. He added “An annual haunt for the IMEX Sales team is Im Herzen Afrika. It is Ethiopian food eaten using specially made pancakes and is perfect for us as we share the large meat and veg platters so we can get a variety to choose from. The food is delicious and extremely healthy, some dishes have a little spicy heat to it others are earthy with lots of pulses and spice. The drinks are different with great fresh juices as well as speciality wine and beer. The environment is brilliant the restaurant is covered in sand and you are seated on benches or the floor as if you were in Africa. As I initially said it is our annual Team outing and we always look forward to it. If you don’t mind sharing food, don’t need a formal restaurant environment and happy to eat with your hands this is the place for you”. Here we go with our tips. I’d like to hear from you what would be your best picks and my aim is to keep this blog post updated on an ongoing basis and I’ll aim to visit all your recommendations! Share with us in the comments below.